Yes, I know it's not a fancy $$$ racing bike, and it's got the name of a team with whom I have no affiliation, but it is a step up from the 80s steelie I am racing now. -How many folks pay thousands to get a team frame to whom they have no affiliation? 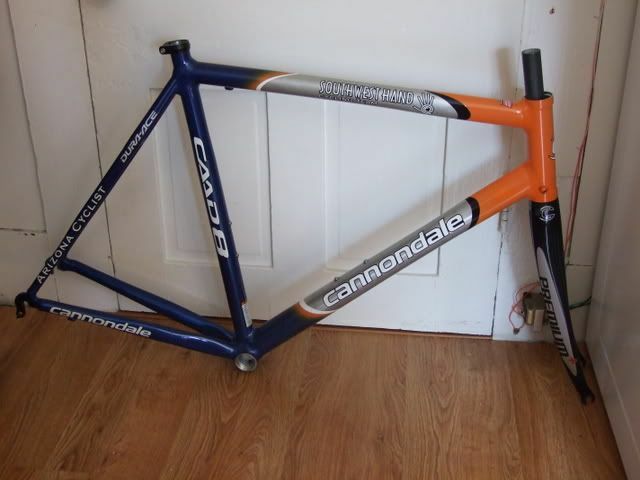 - At $315 bucks for frame and fork (Premium +), how could I not? The catch, I have to get down to my goal "racing weight" of 180 (Or pant size 32) before I build it up. Nice frame, just make sure to have Dura-Ace on it, or have it repainted.